With a calendar chock-full of primary elections, May was an especially busy month for the campaigns and organizers working to win in November. Small-dollar donors never faltered, raising $63,464,089 for a new monthly record of 7,255 Democratic campaigns, progressive organizations, and nonprofits on ActBlue. The primary season excitement was so strong that grassroots donors also surpassed the total amount of money raised on ActBlue in the entire 2016 election cycle! From January 2015 through December 2016, small-dollar donors on ActBlue raised $781 million. By midnight on May 31, 2018, they had raised $821,113,155 for the 2018 cycle! And the busiest months are still to come. Check out all of the highlights from May below. Grassroots donors made 1,473,522 contributions on ActBlue in May to support a record-breaking 7,255 unique groups. These are first-time candidates for office, advocacy groups working to protect immigrant rights, and nonprofits fighting for gun control, just to name a few. We took a closer look at the composition of these groups and found that two-thirds of the campaigns and organizations that were raising money on ActBlue in May raised their first dollar on our platform during the 2018 cycle. From choosing to run for office so they can enact long-term change themselves to creating organizations that will far outlast the Trump administration, more and more people are continuing to join the resistance. And what’s even more exciting is that they are recognizing the power of small-dollar donors! With ActBlue Express, donors can securely save their payment information with us so that in the future they can give to any campaign or organization that uses our platform with a single click. We added 71,224 ActBlue Express users in May, which means we’re now less than 200,000 users away from 5 million! Mobile contributions continue to make up nearly half of all contributions on ActBlue. Once candidates make it out of primary season and go up against Republicans backed by mega-donors, it will be even more important for campaigns to prioritize mobile giving so grassroots supporters can easily give whenever they want (or whenever a big story breaks). 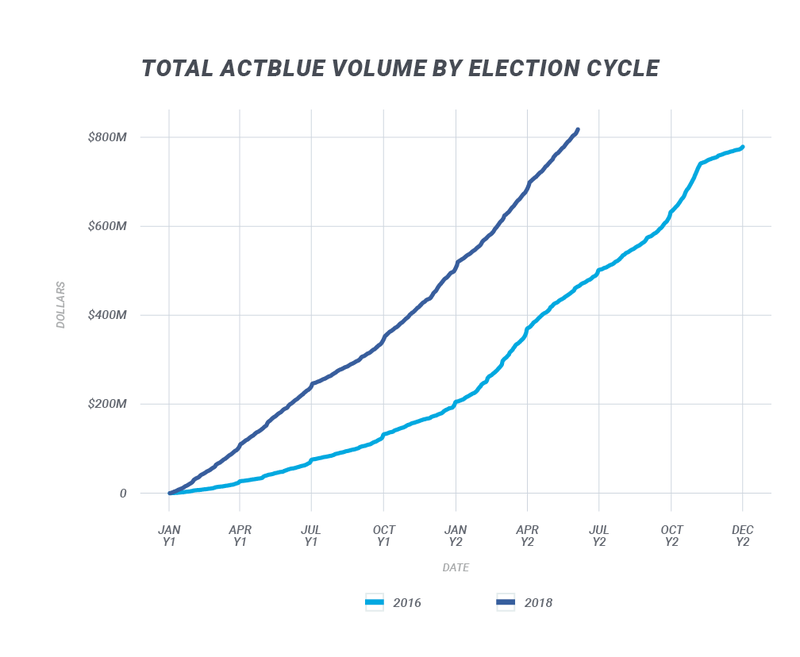 Recurring contributions made up 20.4% of the total volume on ActBlue in May. These donations helped sustain primary campaigns during get-out-the-vote efforts and will be crucial to powering a blue wave in November. The small-dollar donor movement was stronger than ever in May as concerned citizens and new activists showed they have no problem keeping up with the unprecedented number of candidates and contested races we’re seeing now. Our people power is only going to increase the closer we get to Election Day, and we can’t wait to see what other records grassroots donors set by November! If you have questions about this blog post or want help fundraising for your favorite candidate or cause, get in touch with us at info@actblue.com.